Do you love trading and dealing in the stock market? Do you always need to have your finger on the pulse of what’s happening in the market? For those who not only need to know all the latest news and updates within the wheeling and dealing world, but need to make sure that the information they’re receiving is accurate, there’s now an app for that. It’s called the Bloomberg app for the iPhone and it will give you all the latest and most important information right at your fingertips. 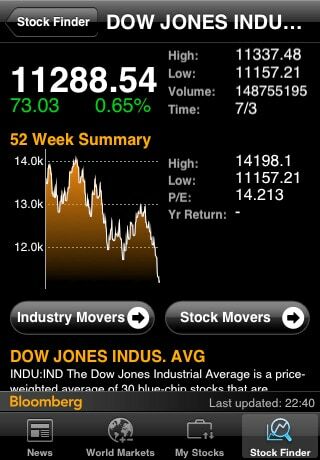 On Bloomberg iPhone app you’ll not only find news regarding the stock market, but stock quotes, company descriptions, who’s leading and lagging in the market, pricing charts, and trends in the marketplace, with full analysis. Plus, if you have certain stocks that you want to track, you can earmark those too so you’ll always have quick and easy access to the ones you’re most interested in. The Bloomberg app for the iPhone or ipod touch is so trusted that over 280,000 professionals from around the globe use it. Imagine knowing the moment it happens when that approval comes through that is going to make your stock soar. Or find out before it’s too late that you need to get out, and quick! One of the best things about this app is that it’s absolutely free and you can download it here. Beware Cheating Spouse! iPhone Spy Apps can catch you!